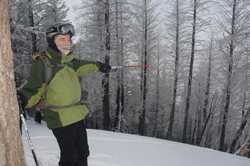 Joe Miczulski, a winter sports specialist with the U.S Forest Service, above, points along Guyer Ridge on Bald Mountain to trees that were scorched by the Castle Rock Fire in 2007. The fire made trees within the ski area susceptible to infestation by the Douglas fir bark beetle, which will likely cause trees along the upper Warm Springs slopes to turn red and begin dying next summer. Infested trees can be identified by the presence of “frass,” right, a fine reddish-brown dust expelled by the beetles as they bore through the inner layer of bark. Offers future model for Wood River Valley? End of an era in the West? How about curing our own?